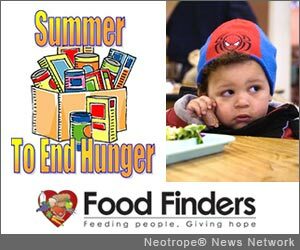 SIGNAL HILL, Calif. /California Newswire/ — Food Finders announced today that it is kicking off its 3rd Annual "Summer To End Hunger" Food Drive, starting May 1st. The food drive will run through the entire month of May, and food that Food Finders collects during the May 11 Stamp Out Hunger postal drive will contribute to the Summer drive effort. Businesses, clubs, communities – anyone who wants to help – can participate. Food Finders is dropping off collection bins at sites and also accepting food at its office/warehouse location in Signal Hill. "Summer is a rough time for many of the families with children who receive free and reduced-price breakfasts and lunches through the national school meal programs. When school lets out, these children are at a higher risk for hunger," said Diana Lara, VP of Operations, Food Finders, Inc. The food will be sorted and boxed and delivered to local pantries, Boys and Girls clubs, youth centers and shelters that serve primarily families with children. "We have a list of specific items that we are collecting, which is available on our website, or we can email or fax it to anyone who requests it," Lara also shared. Anyone interested in donating, whether through a local collection site or directly, please contact Diana Lara at 562-283-1400 x101 or dlara@foodfinders.org for more information. A complete list of needed items can be found at http://www.foodfinders.org/ on the homepage under Summer To End Hunger food drive. Food Finders, Inc. is a multi-regional food bank and food rescue program headquartered in Signal Hill that serves L.A. and Orange counties. They pick up donated food from hundreds of local grocery stores, bakeries, restaurants and produce markets and distribute it directly to missions, shelters and social service agencies to feed the needy and impoverished. Volunteers and staff drivers pick up and deliver on a same-day basis. On average, Food Finders helps provide enough food for 40,000 meals a day, reducing the amount of food insecurity prevalent throughout Southern California. Food Finders is a 501(c)3 non-profit.